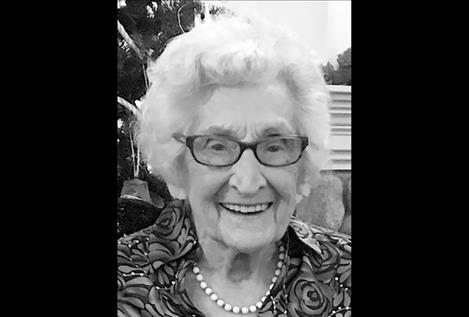 POLSON — Mildred G. Stevens, 96 formerly of Santa Maria, California, passed away on Thursday, May 10, 2018, at St. Joseph Medical Center. At her side were her three children, Gregg of Indianapolis, Indiana, Carol of Brooklyn, New York and Doug and his wife Tania of Ronan. Mildred, or “Midge” to her friends, was born on Jan. 5, 1922, in Fairfield, Illinois, to Clarence and Emma Viola Holacher. She was preceded in death by her husband, Roger; her older brother, John; and an older sister, Ann. Midge was a bright student and graduated from high school early, at age 16, going on to attend Southern Illinois University at Carbondale and Illinois University at Champaign-Urbana, Illinois. There she earned a bachelor’s degree in home economics. Midge also married Roger Stevens soon after university in 1944 and later set up their home in Homewood, Illinois, just south of Chicago. In the following years she moved with her family to several states and countries including Ohio, England, California, Canada, Washington and Montana. While living in England, she travelled to many of the countries in Europe. Later, she and a friend took a three-week journey through Thailand and Cambodia. Midge lived in Polson from 2013 until 2018 where she had many friends in the community. A loving wife, mother, grandmother and great-grandmother, she always enjoyed times with her family, almost as much as they enjoyed times with her. Her wit and quick smile always ensured that everyone felt welcome and warm around her. Memorial Services were held at St. Joseph Assisted Living in Polson on Tuesday, May 15, 2018, at 11 a.m., where friends and family could honor her life. Memories and condolences may be sent to the family at: www.thelakefuneralhomeandcrematory.com.